Hospitals aren’t typically known for their warmth, but Casey House in Toronto isn’t a typical hospital. 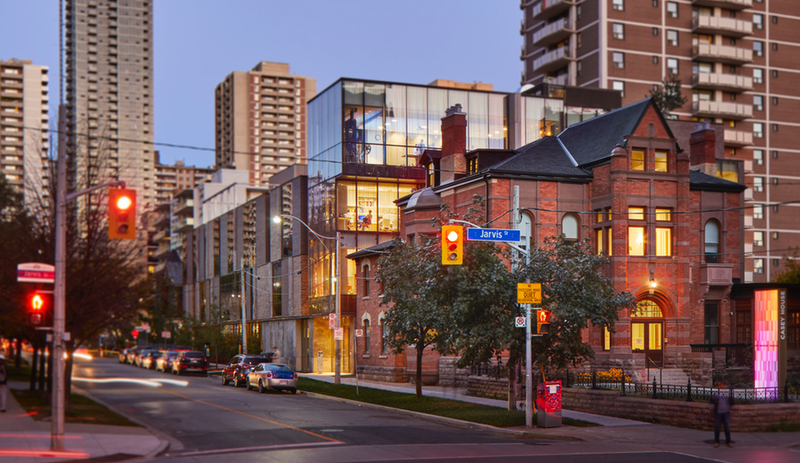 Canada’s oldest stand-alone care centre for people with HIV and AIDS, the downtown facility has been treating patients with the still-stigmatizing virus and disease since 1988, first as a hospice out of a Victorian-era mansion, more recently in a striking new complex that grafts a second Victorian pile on busy Jarvis Street onto a handsome rectangular addition stretching an entire city block behind it. Designed by Siamak Hariri of Hariri Pontarini Architects (HPA), the new hospital encompasses 59,000 square feet over four storeys, greatly expanding Casey’s House’s ability to treat its clientele (it now accommodates both in- and out-patients, some 20 per cent of whom are homeless) as well as its visibility in the city and community. 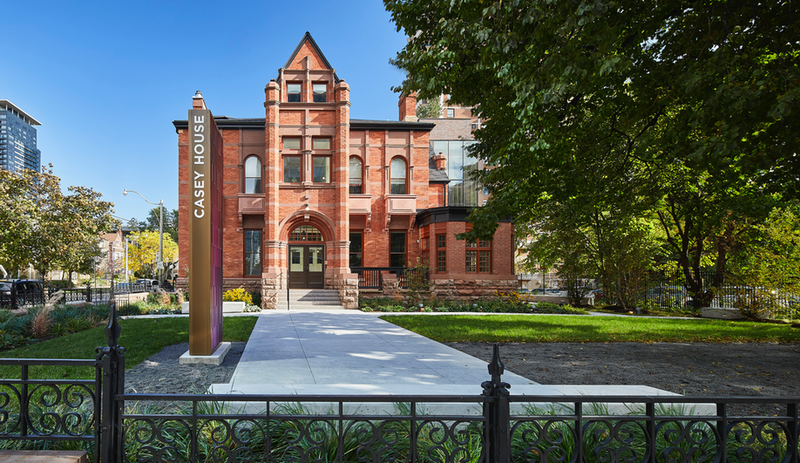 An illuminated, monolithic signpost bearing Casey House’s name boldly announces its presence on Jarvis, just a block west of its original, 10,000-square-foot home. 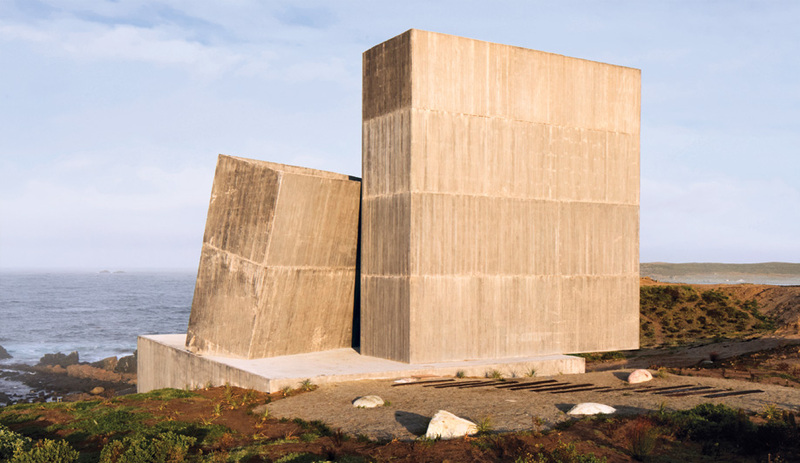 How can architecture be therapeutic? In addition to incorporating such elements as a two-storey limestone fireplace in the hospital’s ground-floor gathering space, a warm materials palette (including heavy-duty vinyl flooring that mimics wood) and long, anti-claustrophobic sightlines from one end of the building to the other, lead architect Hariri aimed to give Casey House’s inhabitants, through the building itself, a metaphoric hug. In the history of HIV/AIDS, the hug has been a potent symbol. In the 1980s, Princess Diana famously did her part to destigmatize the disease by openly embracing AIDS patients. 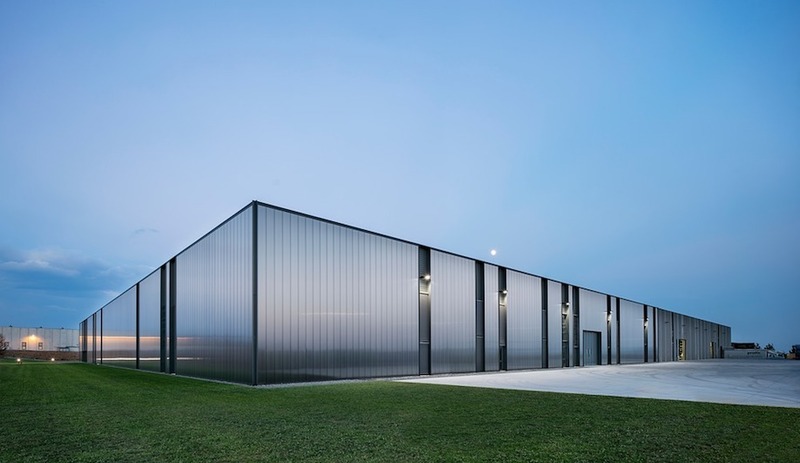 At Casey House, HPA says, the concept of embracing animates the new building, its vertical and horizontal planes visually suggesting a hug. The addition, for instance, reaches over and around its Victorian counterpart, an 1875 manse that was sensitively restored with the input of heritage consultants ERA Architects Inc.; it now houses administrative offices (including Simons’) and meeting rooms. 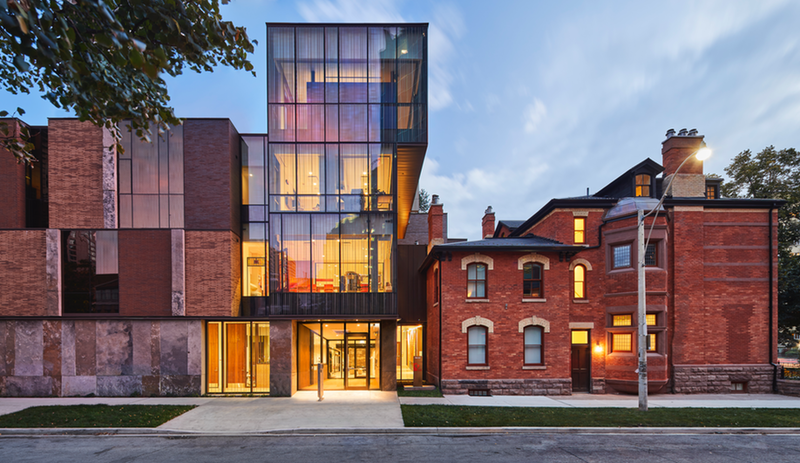 The addition’s façade, meanwhile, is an elegant patchwork of various brick treatments, heavily tinted bronze glass (which allows patients to see out but also maintains their privacy) and crust-faced limestone. 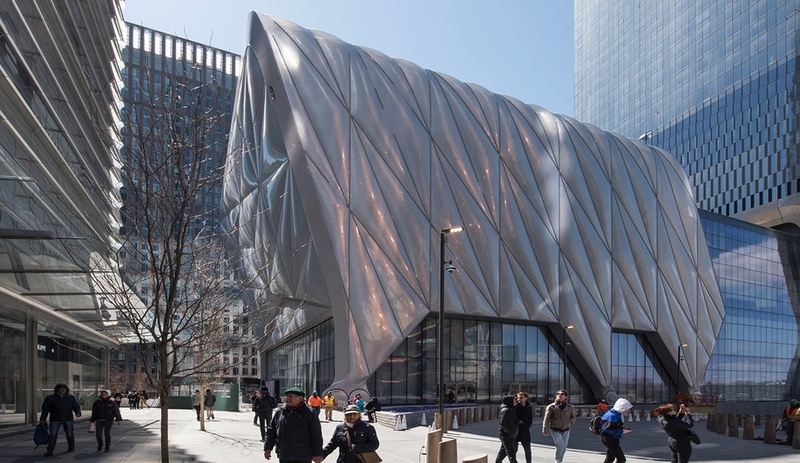 As HPA describes it, it’s an “architectural manifestation of the quilt,” a memorial device long used by both Casey House and the AIDS movement at large to record the names of people taken by the disease. 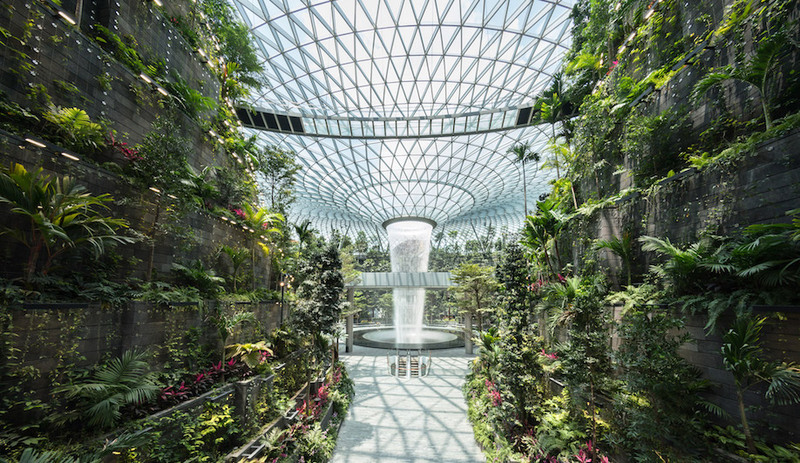 Inside the addition – and most importantly to the welfare of patients – a central courtyard provides yet another metaphoric embrace. 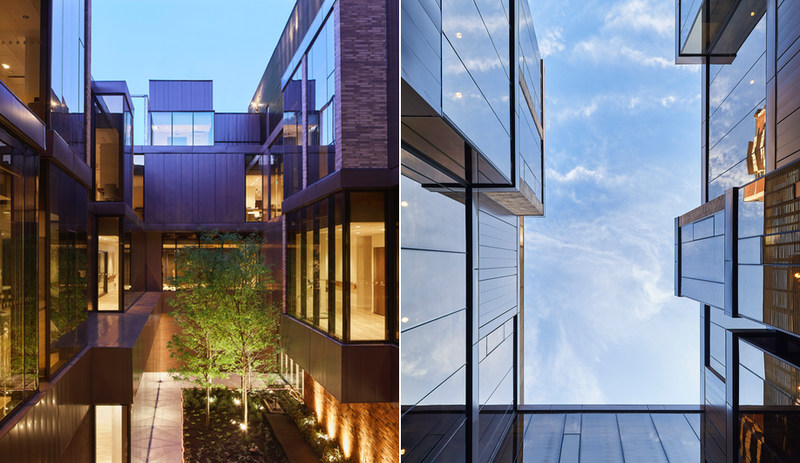 “Beautifully landscaped and alive,” the courtyard, which is open to the sky, is visible from every corridor and in-patient room, allowing direct sunlight into the core of the building on all floors. 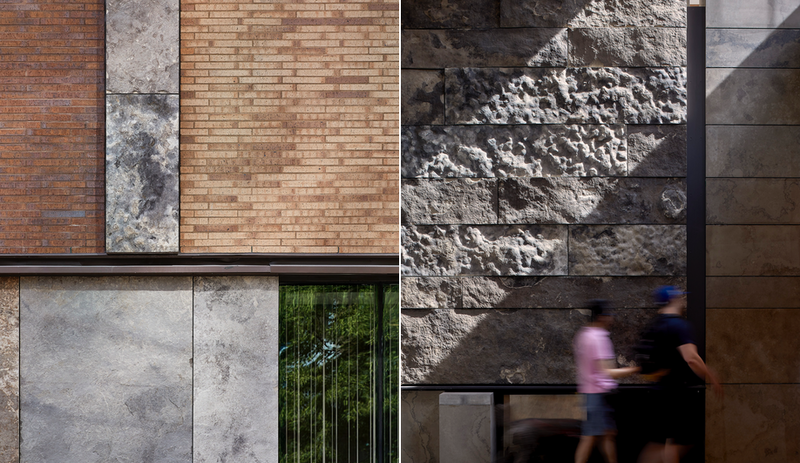 While a front garden, surrounded by beech hedge, sits outside the Jarvis Street façade, the courtyard allows users to access “life-affirming green, water and light” (in the form of trees, a fountain and sunshine) within the cocooning safety of the hospital’s interior. Other, less visible features also contribute to patient comfort and dignity. Sleek rows of lockers, for instance, provide homeless clients with somewhere to store their medications, while all in-patient rooms have operable windows, different colour schemes and compartments that allow hospital staff to remove their laundry and refuse without entering their rooms. 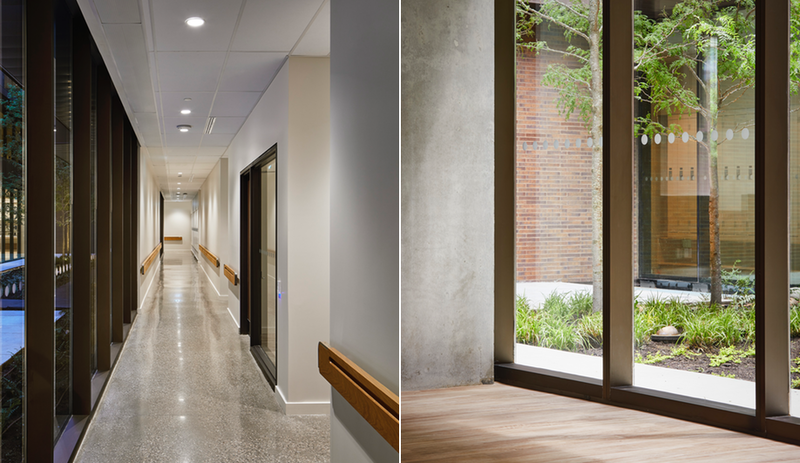 Those in-patient rooms are clustered on the third floor of the addition, while the second level houses therapeutic rooms, including massage rooms and an art therapy studio. Reception, a restaurant and communal areas are centred on the ground floor, while the top level houses a boardroom and other administrative offices. Casey House’s organization and patient-care features were based on a long and rigorous consultative process with both administrators and patients, says Howard Wong, who was on the HPA team and joined Simons on the site tour.